No one ever accused Doug Fearn of cranking out new products for new products’ sake. In development for nearly 10 years, Fearn’s perfectionist approach to tube circuit design has culminated in the long-awaited release of the high-end VT-7 dual-channel compression amplifier ($4,400). Like Fearn’s earlier vacuum tube preamp and EQ offerings, the result of his labors is a high-quality audio path combined, in this case, with a transparent compression circuit. The two channels of the VT-7 can be operated independently or linked for stereo recording, post-processing and mastering purposes. The VT-7 features an all-Class A triode vacuum tube audio path similar to that found in the D.W. Fearn VT-4 LC Equalizer. The gain reduction component of the VT-7 uses a not-so-common pulse-width modulation (PWM) scheme as opposed to the more typical VCA, variable MU and opto-isolator GR designs found in other high-end compressors. Aesthetically speaking, the VT-7 follows the D.W. Fearn family tradition of using a substantial (1/4-inch thick) faceplate heavily coated in gorgeous deep-red polyurethane enamel. Large custom VU meters, heavy-duty toggle switches and vintage-style knobs are logically arranged across the four rack-space front panel; a handsome beast, indeed. Other front panel controls include a stereo link rotary switch and toggle switches to select whether the VU meters display gain reduction or output level. When linked, only the controls of the left channel are operable, with the exception of the right-channel gain knob. The large illuminated VU meters indicate averages (not peak) in both GR and output modes. A large yellow “pilot light” indicates power-on status of the VT-7. The VT-7 can operate on 100, 120 or 220-240 volt (50 Hz/60 Hz) AC, with power supplied through a standard IEC mains receptacle. Inputs and outputs of the unit are on gold-plated XLR jacks. High-quality Jensen transformers are for the VT-7’s balanced-bridging inputs and transformer-balanced outputs. Contact: D.W. Fearn at 610-793-2526, Web Site. The PWM element of the VT-7 uses a solid state circuit to control gain reduction in the analog path. By modulating the width of a very high-frequency square wave, precise changes in the output duty cycle feeding the gain control element (in this case, an audio path shunt design) can be achieved. The result is a very fast and transparent low-noise gain-reduction design with frequency response and distortion specs that do not vary with the amount of reduction. In other words, a well-designed PWM gain-reduction circuit operates like a hand on a fader, albeit a very fast, reliable and tastefully subtle hand. And this is exactly what Doug Fearn has achieved in the VT-7. While the all-Class A tube audio path of the VT-7 bears the sonic “signature” of other products in the D.W. Fearn line, its gain reduction response is very transparent across the available range. For this review I received one of the first VT-7s to roll off the Fearn assembly bench (serial number 0005). Over the course of two months, I was able to use the VT-7 on a variety of sessions and across a wide range of instruments. The defining sonic characteristic of the VT-7 compressor comes from its all-tube audio path, and not, as mentioned earlier, from gain reduction artifacts. For many applications, this proved to be the ideal combination: a warm, pleasing and full sound that did not vary across the gain reduction range. The VT-7 excels as a tracking compressor. Vocals and bass guitar especially benefited from the consistent sound of the VT-7, and were not robbed of fullness even at high gain reduction amounts. With the envelope times and compression curve carefully adjusted, the effects of 3 dB – 6 dB of gain reduction used while recording a series of stereo- and mono-miked acoustic instruments were absolutely undetectable. My eyes were glued to the GR meters, in awe of the adept performance of the compressor. The best proof was in the recordings, which were pleasingly limited dynamically, yet still sparkled with life, impact and richness. 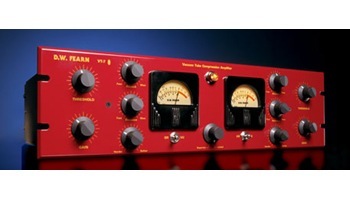 I also had the opportunity to use the VT-7 as a stereo buss compressor on mixing and mastering sessions. In these cases, I typically inserted the Fearn on the mix bus in Nuendo via a Universal Audio 2192 A/D-D/A converter. Here, the VT-7 was very effective when used for subtle gain conforming, and to warm up and “homogenize” all-digital recordings. Even in its hardest setting, I didn’t find the VT-7 quite as effective for jobs that called for the typical brick-wall limiter sound (and all that implies). The only major item on my wish list for the VT-7 would be external side chain access. Short of that, some method to exclude low frequencies in the detection circuit would have improved its versatility in mix buss applications. The D.W. Fearn VT-7 is no doubt one of the finest compressors I have had the pleasure of using, if not one of the finest available, period. The combination of a full and detailed Class A tube audio path with a thoughtful and transparent gain reduction design makes the VT-7 an ideal compressor for tracking use: It provides subtle-yet-effective dynamic control without locking you into the effects of compressors whose distortion and frequency response specs decrease proportionally to gain reduction.